Can rider-experience programs turn around the U.S. motorcycle industry? A downbeat narrative has settled into parts of the American motorcycle market. It goes a little like this: Sales are way down, core buyer demographics are shrinking, and younger folks aren’t into owning new bikes. Manufacturers have been revising their marketing playbooks to get more Americans on motorcycles. Industry players have been moving toward greater customer engagement, lifestyle branding, and rider experience programs. So, do the U.S. motorcycle sales stats support the pessimistic outlook? Can the industry programs aimed at improving the situation really make a difference? Let’s take a look. A look at the numbers shows why there’s industry anxiety. Sales of new motorcycles in the United States took a 50 percent dive from over one million a year pre-recession, and haven’t budged much since. Then there’s the demographics of the Baby Boomer, Millennial gap. A closer look reveals it’s actually the Boomer and everyone else gap. A growing share of the shrinking U.S. motorcycle retail market — now nearly 50 percent — is concentrated with buyers over 50. Since 2009, the number of new motorcycles purchased by Millennials and every other age group has continued to drop. These trends are the reason some in the motorcycle industry are shaking in their riding boots. As Baby Boomers age, they will buy fewer bikes. And if Gen Xers and younger Americans don’t step up to fill the gap, the U.S. motorcycle market could peter out. So far, the one positive sales trend lies with women. Female purchases of new bikes in the United States have steadily grown since the late 1990s and the percentage of motorcycle owners who are women is nearly double what it was 20 years ago, according to the MIC survey. Rider-experience programs: who’s doing what? The decline in new motorcycle sales in the United States has forced new marketing strategies and a fair bit of industry debate. The days of simply engineering good machines and running advertisements to sell them are past. Enter industry-led rider-experience marketing. While there’s no hard and fast Moto-Webster definition — after surveying the landscape — I’ll take some liberty to shape one. Industry-led rider-experience programs are those that teach novices to ride (and get licensed), teach existing riders to ride better, and bring together both green and seasoned bikers for two-wheel-related activities — usually around the sponsoring company’s motorcycles. The goal is typically to go beyond traditional advertising to get more people on, experiencing, and buying new motorcycles. I reached out to every major motorcycle manufacturer to see who’s doing what in this space and did a bit of online research on those who didn’t respond. Honda appears to have the holeshot on this emerging marketing playbook. Honda has Rider Education Centers around the country where new riders can be introduced to motorcycling. Honda photo. Honda centralizes its programs online. The company’s Learn To Ride portal welcomes prospective entrants with a video and takes anyone interested through a six-step process. This includes choosing street or dirt, signing up for a rider training course (managed with the Motorcycle Safety Foundation), getting licensed, selecting gear and a motorcycle and — if one makes it through all that — connecting with Honda rider communities to find biker buddies. This program feeds into Honda’s Rider Education Center programs across the country. Indian Motorcycles doesn’t offer learn-to-ride programs, but it has a robust rider experience docket, according to Senior Marketing Director Reid Wilson. “Our Motorcycle Riders Group (IMRG) is integrated on our website and with our dealers and has 200 chapters and 30,000 members globally and grew 25 percent in 2017,” he said. A member login gives motorcyclists access to Indian-sponsored national riding events (10 planned for 2018) and the ability to create their own. National events bring perks, such as access to entertainment, a magazine, and new product info before it’s released to the public. Indian also brings in third-party partners, such as Jack Daniels, to make the social mix more interesting. It’s not formally connected to the IMRG, but Wilson noted the company operates a demo tour and allows demos of its bikes at its dealers. “We love to get people on our motorcycles as much as possible,” he said. 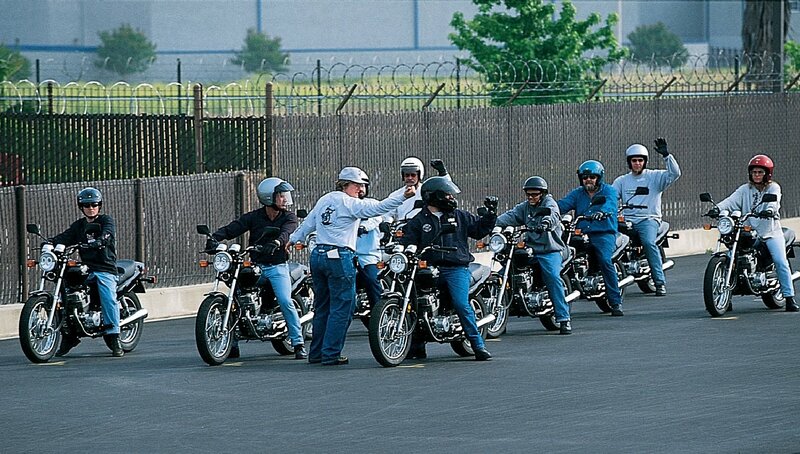 A BMW U.S. Rider Academy course. BMW photo. BMW Motorrad USA has a variety of rider training courses, with a goal of “covering both training of existing… and entry-level riders,” explained Marketing Communications Manager Mark Buche. Under the umbrella of its U.S. Rider Academy, BMW offers fee-based on- and off-road road courses at its training facility in South Carolina. It also offers dirt and street training through partnerships with RawHyde Adventures and the California SuperBike School. “In all our programs and the training partners... we do make sure they are catered to and have the pathway for newer riders as well,” said Buche. What else is out there? Ducati has its Ducati Rider Experience Academy training programs in Europe, though a company spokesperson couldn’t confirm murmurs (I’d heard) Duc may bring DRE to the United States. Other big U.S. market share players, such as Suzuki, Kawasaki, Harley, KTM, or Yamaha didn’t return info requests. Suzuki has a Rider Education tab on its website offering deductions on motorcycle purchases for rider education fees. Harley’s Rider Academy aims to get Millennials on motorcycles and trained 62,000 people last year, the company announced as part of its quarterly report. CEO Matt Levatich has set a company priority of “building riders,” not building motorcycles. Honda's web portal for new riders takes beginners from learning to ride, to licensing, to choosing a bike, gear, and finding road-trip partners. Rider-experience programs to the rescue? There are a growing number of industry-sponsored ways to learn to ride a motorcycle and share two-wheel experiences with others. Can these programs reboot new U.S. motorcycle sales to pre-recession numbers? Honda said it has increased the number of female and entry-level buyers, but that has as much to do with shifting product design as rider-experience programs, Honda execs said. The company has expanded the number of motorcycles with less weight, smaller engines, lower seats and lower prices, all of which make them more widely accessible both physically and financially. BMW, too, has added products better positioned to capture new riders, such as its one-cylinder, $4,750, 349-pound G 310 R.
Sanford C. Bernstein Industry analyst David Beckel suggests slumping new U.S. motorcycle sales over the last decade may have more to do with mismatched product design and placement than marketing or a diminished rider base. Give a Shift founder Robert Pandya follows the same wavelength. “There are probably three used motorcycles sold to every new one,” he said, but he comes back to flawed marketing. Indian’s Motorcycle Riding Group has 200 chapters and 30,000 members. Indian photo. Can industry-led rider-experience programs boost new U.S. motorcycle sales? “Anything the industry does is probably helping at some level, but whether that’s a compelling level is the question,” Pandya said. So maybe the simple conclusion from all this is that U.S. industry-led rider experience programs need to be more robust, must be paired with design and product placement (i,e., smaller bikes with more tech), and should be more collaborative versus siloed among companies. Even then, a little spreadsheet math shows that returning to pre-recession levels of new bike sales in this country could be a pipe dream. It would take 12 years of consistent five percent growth for new motorcycles sales in the U.S. to meet that 2008 marker of over one million a year.